Operating profit for the nine month period ended 30 September 2018 of AED 1,738 million, lower by 8% compared to the same period in 2017. Loans and advances of AED 69.2 billion as at 30 September 2018, up by 3% over the previous quarter. Liquidity position being well managed with loan to deposit ratio at 94.8% and advances to stable resources of around 84% as at 30 September 2018. Asset quality being prudently managed with NPLs to gross loans ratio of 3.7% and loan loss coverage ratio of 130.1% as at 30 September 2018. Union National Bank (UNB), one of the leading banks based in the United Arab Emirates, recorded a profit of AED 1,280 million for the nine month period ended 30 September 2018. The profit for the third quarter of 2018 of AED 438 million was higher by 5% over the previous quarter and was up by 7% over the same period of prior year. Commenting on the results, Mr. Mohammad Nasr Abdeen, Chief Executive Officer,Union National Bank said “The Group has followed a strategy of measured growth which has resulted in an increase in business volumes and related revenues during the third quarter while other financial indicators remained strong with robust balance sheet, sound liquidity position, solid capital ratios and improving margins”. He further added that “The UNB Group has continued to invest in its franchise ensuring that the Group is well positioned to pursue and support prudent growth”. The operating income for the nine month period ended 30 September 2018 of AED 2,645 million was slightly lower over the same period of 2017. This was mainly due to a decline in non-interest income by 28% that was partly offset by an increase in net interest income which grew by 5%. The non-interest income was adversely impacted mainly due to reduction in fees and commission income, lower gain on dealing in foreign currencies and derivatives and a decrease in other operating income. The net interest margin for nine month period ended 2018 was 2.74%, higher by 14 basis points compared to corresponding period of 2017, leading to an increase in the net interest income. Net loans and advances were AED 69.2 billion as at 30 September 2018, lower by 3% as compared to prior year end due to scheduled loan repayments, impact of IFRS 9 transition adjustment and Group’s conservative positioning. Net loans increased by AED 1.9 billion in third quarter driven by assets booked in the Wholesale banking segment. The total assets of the UNB Group remained flat on year on year basis at AED 104.9 billion as at 30 September 2018. The customers’ deposits marginally decreased by 2% to AED 73.0 billion as at 30 September compared to the corresponding period in the previous year. 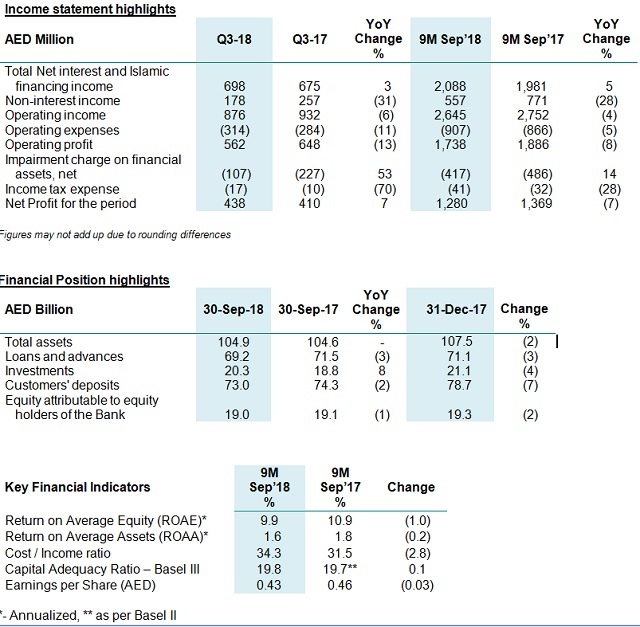 The liquidity position of the group remained strong with liquid assets, including investments constituting 30% of the total assets; loan to deposits ratio was 94.8% as at 30 September 2018. Key regulatory liquidity ratios remained sound with advances to stable resources ratio at around 84% as at 30 September 2018. The Bank remained well ahead of the Central Bank of the UAE set requirements both for Liquidity Coverage ratio and the Eligible Liquid Assets ratio. The operating expenses increased by 5% in the nine month period ended 30 September 2018 over the same period of 2017 as the Group has continued to invest for future growth. The cost to income ratio of the Group was at 34.3% for the nine month period ended 30 September 2018. Asset quality metrics during the nine month period ended 30 September 2018 have been stable, with the ratio of non-performing loans and advances to gross loans and advances as at 30 September 2018 improving to 3.7% as at 30 September 2018 (31 December 2017: 4.3%). The overall loan loss coverage improved to 130.1% as at 30 September 2018 (31 December 2017: 97.1%). The annualized return on average equity, excluding Tier 1 capital notes, for the nine month period ended 30 September 2018 was 9.9% (9M-2017: 10.9%) and the annualized return on average assets was 1.6% (9M-2017: 1.8%). The earnings per share for the same period ended 30 September 2018 was AED 0.43 (9M-2017: AED 0.46). All the above capital ratios are as per Basel III and computed in accordance with the Central Bank of the UAE guidelines. These Capital ratios remain considerably higher than the regulatory thresholds set by the Central Bank of the UAE. Note: On 4th September 2018, UNB announced the commencement of exploratory talks regarding a potential merger with Abu Dhabi Commercial Bank. At this time, there is no certainty that these negotiations will result in a transaction. UNB is committed to the highest standards of regulatory disclosure and will update the market if and when there are any material developments. UNB was awarded with the distinguished gold medal for its positive contribution towards the community by the Arab Organization for Social Responsibility and the UAE Excellence Awards Academy.